The current Refugee Crisis in Europe can be regarded as the most significant humanitarian challenge Europe has faced since World War II. In response, Deloitte has initiated a global program, called Connect for Purpose to find ways how technology can help resolve some of the refugee challenges and obstacles. Accurate data about refugees and the availability of this data regarding the current situation and circumstances is essential. Deloitte has convened a refugee centric ecosystem, including key academic partners, variety of government and NGO organizations, and private businesses. Collective expertise, data insights and technology will be leveraged towards a joined purpose to connect with refugees. Primary data collection is planned to gain insights into economic lives of refugees and potential impact they can make. In addition to this Knowledge Portal, other technology platforms will be developed. For example, a matching solution will connect data on specific technical talent of refugees to the high tech demand of qualified engineers. Join this presentation and learn more about Connect for Purpose and the ecosystem approach that has been used for developing the current pilot phase. Furthermore, also find out if there are possibilities you see to contribute to this program as well. Stef Oud joined Deloitte Consulting 15 years ago. He graduated from Groningen State University (MBA) and various executive education programs at Harvard Business School and INSEAD. Prior to Deloitte worked for Andersen Consulting, CSC and Noblestar Corporation. At Deloitte, Stef has held various EMEA and Global leadership positions focused on managing professional services practices with responsibility for technology and organization transformation programs. 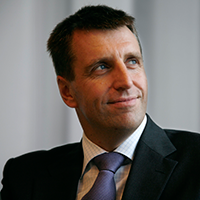 His current responsibility at Deloitte includes leading the Technology Industry Clients and Markets as well as the High Tech Competence Centre (HTCC) which is based in Eindhoven. In addition he is an active volunteer for WarChild in Amsterdam and related to this he leads the Connect For Purpose program, initiated globally by Deloitte to help address the Refugee Crisis in Europe.